Kombucha is a fermented black tea, Jun is a fermented green tea. Each require their own culture or starter which looks like a white rubbery pancake, called a SCOBY (Symbiotic Colony Of Bacteria and Yeast). The SCOBY pancake transforms sweetened black or green tea into a slightly carbonated, slightly alcoholic drink of health giving acids and nutrients such as glucuronic acid, glucon acid, lactic acid, B-vitamins, amino acids, probiotic substances, and other products. The SCOBY is therefore, a biochemical factory (similar in function but different in shape to kefir grains). The alcohol production by the yeasts in the SCOBY contribute to the production of acetic acid (type of acid in vinegar) by the bacteria in the SCOBY. Other acids produced include butyric acid, malic acid, oxalic acid and usnic acid. Many of these acids play an important role in rebalancing the pH, thus, the effectiveness of enzymes, and, the population of microbes in the gut. Kombucha and Jun’s low pH provides many of the same benefits seen with the Apple Cider Vinegar therapy with the added benefits of being a probiotic, having the antioxidant benefit of tea and not being inflammatory to some blood types. A thousand Kombucha tea drinkers were surveyed regarding the benefits they noticed when drinking the tea. Kombucha ‘feeds’ on tea and sugar to make an effervescent, tart, probiotic, antioxidant, nutritive drink. After the tea cools add 2/3 c sugar and stir to dissolve all. Add the sweetened tea to a glass culturing container and add theSCOBY. 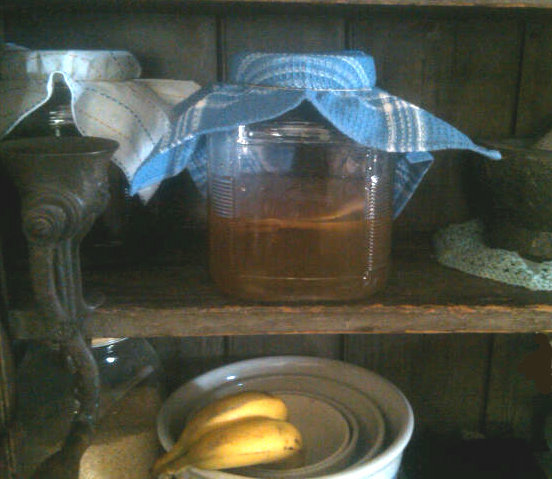 Submerge theSCOBY a few times to release any air that may have gotten captured under it. It will eventually rise due to the fermentation bubbles thatform under it. Cover the top with a towel and set aside for 1-2 weeks. I look for the thickness of the culture and when it looks like they are separable (the time really is not critical) I brew up tea for the next batch. After gathering some experience, you’ll be able to tell by smell when thekombucha has cultured to your liking. After adding the SCOBY cover and set aside for 1-2 weeks. The standard process is to remove the SCOBY from the cultured tea and place it in a bowl. Pour the cultured brew through a strainer (I use stainless steel) set in a funnel into a glass 1/2 gallon container, reserving about 1/4 cup in the culturing container to keep the pH down for the next batch of tea. Refrigerate the brew. Add the freshly prepared and cooled tea to the culturing glass container. Divide the SCOBY. This is like separating 2 pancakes that are stuck together. Put one part in the container with the new tea and give the other away. Cover and repeat. I keep 2 jars culturing (about 1 week apart) and just decant the riper one as needed until I use it up. Then I just add more sweetened tea to that container and divide and submerge theSCOBY and cover. Then I’ll start using the other container that has been culturing if it has been going at least a week. Kombucha can simply be decanted from the culturing jar to test for doneness or to enjoy. If you have trouble dividing the SCOBY, fret not. Sometimes I just use a knife to divide them in half. Similar to kefir, though, the more SCOBY, the faster the culturing goes. Also, like kefir, temperature plays a role. The warmer it is, the faster the culturing goes. And culturing too long produces a more vinegary product. It hasn’t gone bad; it just contains more of the acetic acid. If it has gotten very strong/sour, I just add a little apple juice to it in my drinking glass. Some people will drink it straight. To begin you may want to dilute it with water. I use about 1 part Kombucha to about 5 parts water depending on the tartness. Both black and green teas come from the Camellia sinensis plant. Green teas are just ‘withered’ which is a type of drying that removes most of the moisture. Green tea leaves retain their green color and as a result green tea is loaded with the compound epigallocatechin gallate (EGCg), a powerful anti-oxidant. Green Tea is beneficial for all blood types. Black teas are processed a step further and are aged under temperature and humidity conditions that allow some aerobic fermentation. The controlled aging process converts EGCg into other beneficial compounds which possess at least the same antioxidant potency as catechins present in green tea. Many beneficial flavonoids are also produced during the darkening process. Although black tea is an ‘avoid’ for most blood types, the action of the SCOBY on the tea may affect that status. Jun is made in a similar way, using a SCOBY that has developed on green tea and honey. 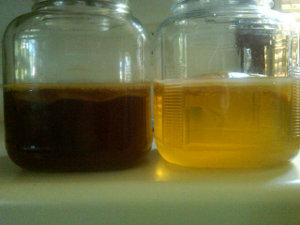 Regular black tea Kombucha on the left; green tea on the right. Bring 1/2 gallon of filtered water to ~ 167 deg F (well below boiling). I use a thermometer with an alarm set at 167 deg. Remove from the heat and add 3-4 bags organic green tea. 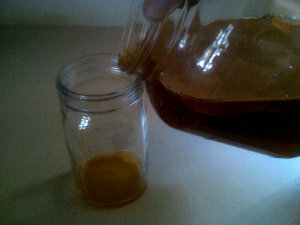 Allow to cool and add 1/2 cup raw unpasteurized organic honey. Dissolve and add this sweetened green tea to a glass culturing container and add the SCOBY, submerging well to release any captured air. You can also include some of the last batch of cultured green tea to lower the pH and avoid some kinds of aerobic microbial action that affects the taste of the end product. Cover and set aside as done with the standard black tea Kombucha. ‘Done’ is determined by your tastes. Some like their Jun still a little sweet, others prefer the tartness of the lactic acid and lots of fizz. You can insert a straw and taste your Jun to determine when in the culturing process it comes to your liking. After the culturing process is ‘done’, as described above, the end product can be enriched, either in therapeutics or flavor by bottling the cultured tea, adding something, capping tightly, and allowing it to sit at room temperature for another 3-4 days before refrigeration. The additions can be pieces of fruit or veggie or ginger (about 1 tablespoon/pint). Juices can also be added such as beet, tart cherry, elderberry, etc. These have natural sugars which feed the fermentation producing a delightful effervescence in securely capped sturdy bottles. Some have reported pressure build up sufficient to explode a bottle so take care not to ignore your culturing products. I got a bottle of rw komucha from the store and it had a blob a little larger than a quarter in it. It seems like a baby xcoby or a piece of one. Can I grow a scoby from this? How big does it have to get before I can use it to make tea. I know nothing about making kombucha at home, but can’t afford to buy it anymore. Alsp wondering about using that much sugar when I’ve been dealing with fungal issues and have been trying to go completely sugar free. Would love some input on this! Yes you should be able to use this – even at its present size – to make Kombucha tea. Just proportion down all the measurements. The scoby feeds on the sugar and the end product, as you know, is actually sour. So the longer the scoby sits in the tea, the less sugar remains. However, you don’t want to starve it so be sure to have a new batch for it to feed on when your tea is ‘sour enough’ for you. Please read this post regarding yeast ‘infections’. I’ve never had this kind of tea. Can you buy a SCOBY to start with, or do you have to make it yourself? And when you start with 3 standard tea bags, can they be green tea bags? Hey Terri, you can try some before making it. Check out the local health food store for their bottled Kombucha. Usually someone gives you a scoby but again, talk to the local health food store. And you can make it with green or black tea and you can make it with 3-5 tea bags i.e. to your liking. I thought you might like to post this link for probiotic lemonade. I used it for my first go at making a probiotic drink and it felt so good in my Type A tummy we drank the whole gallon in one day!! My kids loved it.